Move over, Europe. Your ultra thick, ultra rich, ultra luxe drinking chocolates are great, but sometimes you just want a mug of really good, everyday hot cocoa. The cocoa connoisseurs at Zingerman’s Delicatessen spent months formulating, blending, testing and finally packaging our house blend of hot cocoa mix. Made with Guittard chocolate, it’s got deep flavor without being overwhelmingly rich. Great for everyone in the family, especially kids in après-sled mode. 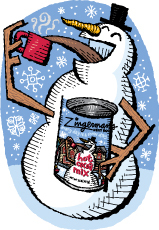 And to level up to hot cocoa 2.0, we've paired the Zingerman's hot cocoa with a bag of fluffy, delicately sweet handmade vanilla marshmallows from Zingerman's Candy Manufactory. They come packed together in our fun, colorful cartoon gift box.